The question comes up repeatedly: How can I improve my business' digital visibility? How can I be more visible online? 1. Are you on LinkedIn? If not, create a robust profile for yourself and your company - one that includes keywords important to you and your business. Here's my personal LinkedIn profile as well as Simple Marketing Now's LinkedIn listing. If you need advice about LinkedIn, consider reading How Do I Make the Most of LinkedIn? 2. Have you created a Google Places listing? This is particularly relevant if you have a physical location. Although I'm more of a virtual business, here's Simple Marketing Now's Google Places listing. Note that your Google Places listing will give you a QR code that you can use in marketing communications. When that QR code is scanned with a smartphone reader, it will direct visitors to your Google Places listing. 3. What about a Facebook page for your business? If you're considering creating a Facebook presence for your business, don't do it using a personal profile page. Not only does that go against the Facebook rules of engagement, but you won't benefit from search engines sharing your content. Instead, create a Facebook Fan page. Once you do, you'll need to engage with your fans and share content with them that they find interesting. Here's Simple Marketing Now's Facebook Fan page. If you'd like more information about Twitter, consider reading How Do I? Do Twitter. Be aware that, the more complete your profiles are and the more active your presence is, the more visible you will be. That's true for your website, too. You should definitely be updating and refreshing your website content on a regular basis - and I'm not talking once a year, more like once a month. Ideally, you'll consider creating a content strategy that supports your business objectives so that all of your digital outposts work consistently in your favor and reinforce the value that your business offers customers and the marketplace. Don't be overwhelmed by the digital world. Keep in mind that it offers businesses unheard of opportunities for visibility and connecting with customers. What's most important is getting started in consistent small doses. Create Outlook or Google calendar reminders and spend 15 minutes a day exploring, monitoring and experiencing the digital world. Think like your customers. Search using terms they might use. Think how you might apply what you observe to the profiles your create and the content you develop. I guarantee you'll be amazed at what you learn! Please, let me know how it goes and how I might help. As you come across other ideas for creating visibility online, I hope you'll share them here, too. Simple Marketing Now, a marketing communications consultancy, helps organizations integrate social media and content marketing with traditional marketing to better connect with customers and improve business profitability. Simple Marketing Now issues the Social Flooring Index which monitors the social state of the Flooring Industry and Flooring The Consumer, about marketing to women and the retail experience. For more information, visit http://SimpleMarketingNow.com. Image credit: Limited Visibility originally uploaded by I'm George. My latest post on the MarketingProfs Daily Fix Blog is live. 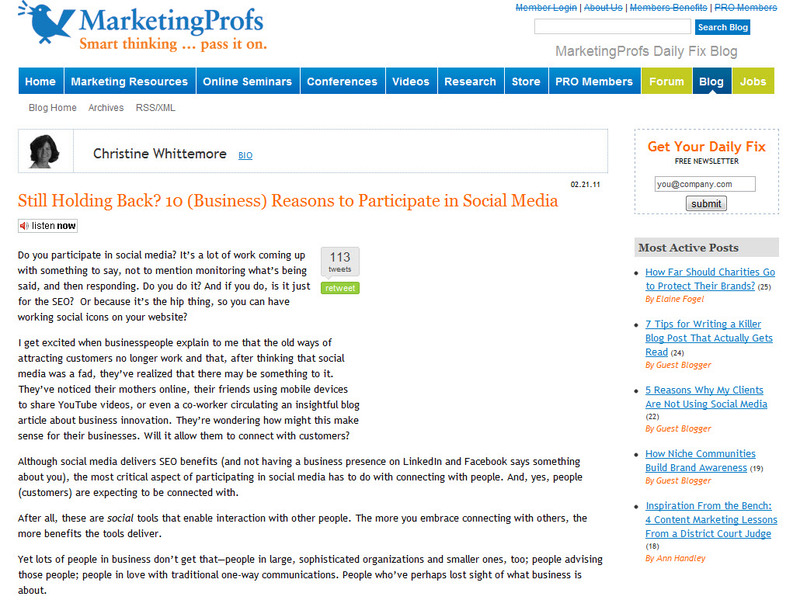 It's titled 10 (Business) Reasons to Participate in Social Media. Are there still social media stragglers in your company? Though not using social media (like Facebook) says something about your company, the most critical part of using it is connecting with people. Customers are expecting to be connected with. Here are 10 good reasons to get social for your business. I bet you have an opinion on the matter. I'd love to hear it. 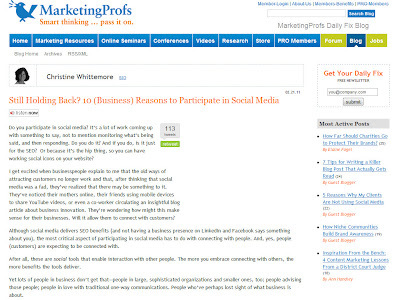 Please join in on the conversation about 10 (Business) Reasons to Participate in Social Media over at the MarketingProfs Daily Fix Blog or here. I've been working feverishly these past few weeks preparing my inaugural MarketingProfs online seminar. 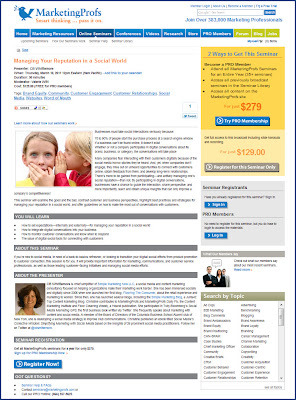 It's titled "Managing Your Reputation in a Social World" and is now listed on the MarketingProfs website. Pretty exciting stuff! This online seminar takes place March 10th, 2011 from 12 noon EST to 1:30pm. Many companies fear interacting with their customers digitally because of the social media horror stories they've heard. And, yet, when companies don't engage, they miss out on unheard of opportunities to connect with customers online, obtain feedback from them, and develop long-term relationships. There's more to be gained from participating—and actively managing one's social reputation—than not. By participating in digital conversations, businesses have a chance to guide the interaction, share perspective, and more importantly, learn and obtain unique insights that can only improve a company's competitiveness! This seminar will examine the good and the bad, contrast customer and business perspectives, highlight best practices and strategies for managing your reputation in a social world, and offer guidelines on how to make the most out of conversations with customers." Managing Your Reputation in a Social World continues the conversation started last year during Social Media Club North Jersey: Customer Feedback in a Social World. If you know of anyone who might benefit from this online seminar, I'd appreciate your help in getting the word out. The content is relevant to anyone new to social media, in need of a back-to-basics refresher, or looking to transition digital social efforts from product promotion to customer connection. For more information, click on Managing Your Reputation in a Social World. I hope to 'see' you on March 10th. In the meantime, what are your thoughts about managing your reputation in a social world? Kinnelon, NJ – Christine B. Whittemore, chief simplifier of Simple Marketing Now LLC, will offer practical marketing and business survival guidance during two educational sessions at Coverings 2011, the premier international trade fair and expo dedicated exclusively to showcasing the newest in ceramic tile and natural stone. It takes place March 14 through 17, 2011 at the Sands Convention Center in Las Vegas, NV. The sessions will offer attendees digital marketing tips to connect with customers. Marketing and promoting your business matter now more than ever in a world where customers educate themselves online first. You must be digitally visible. The challenge, though, for many small businesses is finding the resources [including people] to market effectively while also running day-to-day operations. How then to prioritize what you do so you don’t neglect activities that connect with customers online and offline, while also delivering business results? The solution has to do with thinking about how you deliver value to customers, creating content that addresses your customers’ needs, and consistently making use of that content across all of your customer touch points. The challenge for many small businesses is connecting with customers, particularly the right customers. We can no longer wait for customers to come to us. Instead, we must figure out how to connect with them online and offline and invite them into our space to complete the sales process. That connection process requires that a business have the basics/fundamentals taken care of. 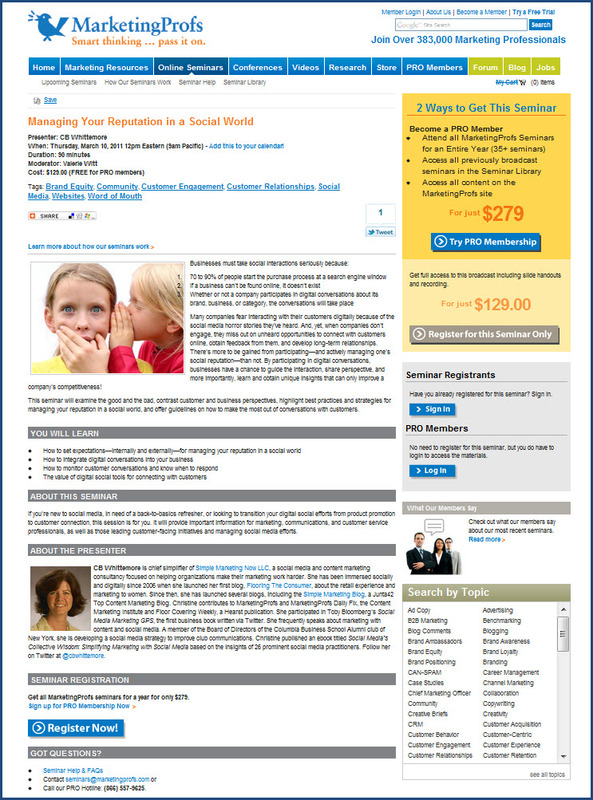 Simple Marketing Now issues the Social Flooring Index - http://www.SocialFlooringIndex.com - which monitors the social state of the Flooring Industry and Flooring The Consumer – http://flooringtheconsumer.com – about marketing to women and the retail experience. 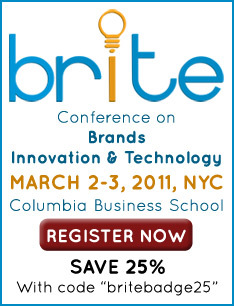 Will you join me for BRITE '11, the Conference on Brands, Innovation and Technology? It takes place March 2 and 3, 2011 in New York City at Columbia University. I consider it a must-attend event for anyone passionate about how digital media, technology and innovation are transforming marketing, business strategy and brands. If you are available, I'm pleased to share with you a 25% savings off of the registration. Simply use code "britebadge25" when you register. Click on this link to BRITE '11 for the conference agenda, registration and speaker details. NOTE: Early Bird registration rate is available through February 14! Last year, we heard Dave Carroll perform United Breaks Guitars and discuss the voice of the customer in a digital age. David Rogers, executive director of Columbia Business School's Center for Brand Leadership and host of the Center's BRITE conference, shared highlights from his then forthcoming book, The Network Is Your Customer: Five Strategies to Thrive in a Digital Age [see my interview with David about The Network is Your Customer]. The learnings and inspiration are consistently intense. Antonio Lucio, Global Chief Marketing Officer, Visa Inc. I'm particularly excited about hearing Shena Iyengar about whom I wrote in Sheena Iyengar and The Power of Choice... and I always enjoy Steve Rubel [see Steve Rubel on Digital Trends BRITE 09]. I hope you can come. I'd love to see you! David Rogers, executive director of the Center on Global Brand Leadership at Columbia Business School in NYC, fits my description of a Renaissance Man. He's an accomplished marketer and teacher of branding, marketing and digital strategy at Columbia Business School. He's a renowned composer and musician, whose brilliant saxophone playing brings new levels of meaning to BRITE conferences. He is also author of the newly released book The Network Is Your Customer: Five Strategies to Thrive in a Digital Age . C.B. : David, congratulations on your new book! How did the concept for The Network is Your Customer develop? DR: The idea for the book came from looking at businesses which innovate digitally. And not all of these are Google, Facebook, or startup companies. They represent a wide range of industries and categories - consumer package goods, businesses involved in politics and philanthropy, and others. All are making prudent, effective use of digital tools to connect with customers. I reviewed hundreds of case studies and focused on those that demonstrated an understanding of the behavior of customers. You see, at the heart of successful business strategies is a profound desire to shape how the business adopts new technology primarily to connect with customers. These are companies that fully embrace that they are in the business of serving customers. C.B. : You highlight many companies in your book - businesses large and small, and in every industry—from consumer, to B2B, and nonprofits [see pages 17-18 of chapter 1]. What makes these businesses stand out? They stand out for three reasons. 1. These are companies focused on pursuing a business objective and they are disciplined about their focus. 2. These companies are committed to adding value to customers; they spend a great deal of time worrying about how to benefit customers. 3. These companies all successfully pursued strategies that were rooted in one or more core behaviors [accessing, engaging, customizing, connecting, and collaborating] inherent to networked customers. C.B. : What are customer networks and why do they matter more than individual customers? A customer network is: the set of all current and potential cus­tomers of an organization, linked to the organization, and to each other, through a web of digital tools and interactions. Why do customer networks matter? We now all of us have access to digital tools for communicating, interacting, and creating on a mass scale. This changes the relationships between individuals and with organizations. Organizations used to be successful embracing a mass market model. They could communicate to, but not interact with, individual customers. That has changed with digital tools; the key to success now is a customer network model where businesses listen to, interact with and create based on their network of connected individual customers who participate dynamically and enthusiastically. C.B. : David, you mentioned 5 strategies during BRITE '10 to truly thrive in this digital age that we live in. Would you describe those here? I describe these five strategies in a recent blogpost titled Five Strategies for Business Growth in a World of Customer Networks and also include examples. C.B. : How are those strategies relevant to business today? DR: The key as I describe in Chapter 8 of The Network Is Your Customer is to really understand your own customer, your company and your objectives. Once you do, you can then map out strategies and figure out which is most appropriate for your business. These strategies can be used to meet business objectives ranging from driving sales, to enhancing innovation, decreasing cost, gaining customer insights, or even building breakthrough products and services - once you truly understand customers, company and business objectives. C.B. : This book seems an natural evolution of the work you've with the Columbia Business School Center on Global Brand Leadership and the BRITE conference which focuses on branding, innovation and technology. How will BRITE '11 further develop the customer network and these 5 business strategies? DR: The launch event for "The Network Is Your Customer: 5 Strategies to Thrive in a Digital Age." took place on January 26th and consisted of a panel discussion with talented innovators who strategically engage with customer networks. More specifically, Lisa Hsia from Bravo Digital Media, Frank Eliason from Citi, Carsten Wierwille from frog design and Russell Dubner from Edelman in New York joined me. Those conversations also previewed BRITE '11 where a great lineup of speakers will present their own stories about how they engage with customer networks. C.B. : David, how do we find you? DR: Visit The Network Is Your Customer which includes reviews, a case study database as well as my blog. I encourage you to download a free chapter of my book, too. Look for me on Twitter: David Rogers, and please do visit [and like] my Facebook page for updates on cases and videos. Or, send me an email and definitely look for me at the BRITE '11 conference which takes place March 2 and 3, 2011 in New York City [Note: more on that in a separate post]. I'm interested to hear from you. How are you noticing the shift to customer networks in your business and with the brands you interact with regularly? A last bit of housekeeping for 2010: an archive of the interviews I participated in on behalf of Simple Marketing Now during 2010. It's interesting for me to look back on these conversations. I had a blast taking part in them and am grateful for the opportunity to speak with such brilliant and talented fellow marketers. Age of Conversation 3: It's Time To Get Busy, May 2010. Chapter titled "Extreme Foreignness, Innovation and Execution"